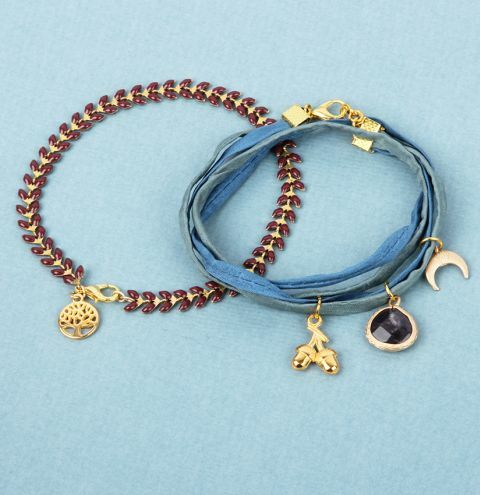 Design a delicate silk wrap around bracelet with matching laurel chain and charms. Measure how long you want your bracelet to be, wrapped twice (or more) around your wrist. Cut 2 lengths of silk ribbon 1cm shorter than the length you need. Your clasp will add some more length to your bracelet. Group one end of the 2 ribbons together and secure them together with one of your gold colour ribbon end clamps. Press this securely using flat nose pliers to make sure it is clamped tightly. Secure the other end of the ribbon in the same way as before with a ribbon clamp. Take your laurel chain and trim it to the length needed to fit around your wrist once or keep it the same if it is already correct. Neatly trim off any chain that won't allow you to add a jumpring. You should have small metal loops to thread your small oval jumprings onto. Take your smaller oval jumprings. Attach one to one end of your laurel chain and attach a larger round jumpring to this. Close the oval ring securely. Repeat this on the other end of your laurel chain. Add a lobster clasp to this larger round jumpring. Measure it against your wrist and add more jumprings as an extension chain to your bracelet if it needs to be longer. Check your silk bracelet is long enough to fit around your wrist twice. If not, attach another jumpring or more to the single ring on one side of your bracelet, to make an extension chain. Finally, take one of your charms and a round jumpring. Attatch this to one or both of your ribbons and close the ring securely. Repeat this for your other charms, attaching them onto the ribbons. You could knot the ribbon inbetween the charms if you wanted to keep them seperated from each other.